If there ever was a candle that smelled exactly like the description on the label, this is it. I impulsively ordered the Bath and Body Works Pumpkin Spice Candle from Amazon the other night for two reasons. 2. It was available for next day delivery through Amazon Prime and my trial subscription was about to expire. Trivial justifications, I know, but scented candles are one of life's little pleasures and quite frankly, I like them. The Pumpkin Pie Candle is described as: A delicious autumnal blend of creamy pumpkin, whipped vanilla and flaky pie crust that's as sweet as your favourite pumpkin pie. It's a pretty spot on description really - like deeply inhaling a Starbucks Pumpkin Spice Latte with an extra shot of syrup. It's just very, very nice. 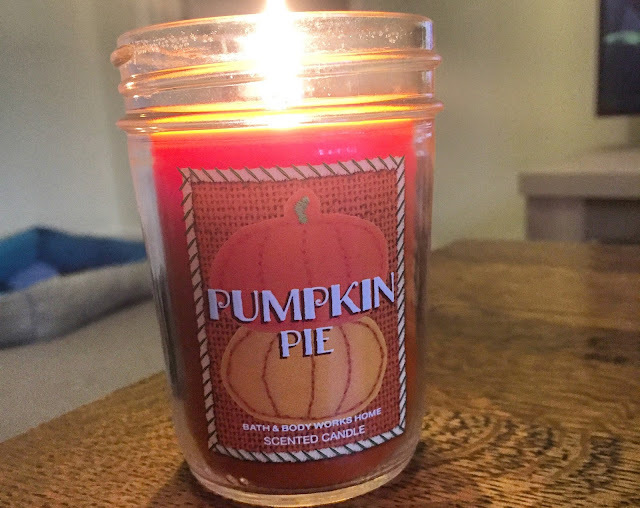 The Pumpkin Pie Candle that I have is only 170g but the scent throw is seriously good- our living room fills with the scent almost immediately after lighting it. It also allegedly has a burn time of 30-40 hours, though that is yet to be confirmed. This candle wasn't particularly cheap but it was still less expensive than a Diptyque 70g candle (though Diptyque really are in a league of their own when it comes to fragrance), so looking at it that way may just be justification enough! Getting your hands on a Bath and Body Works Candle without making the trip to America used to be tricky and super, super expensive but it looks like there are now a few UK sellers on Amazon flogging them for a somewhat reasonable price. If you're keen to try a candle or body product from Bath and Body Works, have a browse on Amazon and see what you can find. I now understand what all the fuss is about with this brand!